Recycling bins are usually made of steel and plastic and having the right bin helps in keeping your kitchen tidy. A large capacity recycle bin allows you to store large amounts of waste therefore eliminating frequent emptying of your bin. 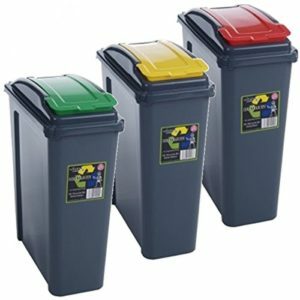 There are many types of bins out there which vary with capacity, technology, durability and price. This guide will help you make the right choice when purchasing one. Bin Liners: This intelligent waste bin allows you to recycle your waste more effectively. The bin liners provided help store your waste in separate compartments. An inner liner has retaining features which secure liners inside vents making their removal much easier. Drawer: The Joseph Joseph features a drawer which offers more flexibility. This is combined with a divider used to separate different waste. Around the drawer are hooks which are used to secure carrier bags and customised bin liners can fit into this compartment. Capacity: This unit offers numerous functions without taking up more space. The Joseph Joseph is available in 36 and 24 litres and these are large enough to accommodate waste from big kitchens. 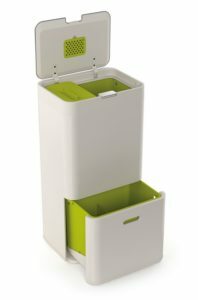 Removable Waste Caddy: This removable food waste system fits both the drawer and the normal waste compartment. Inside, is a bag retaining ring which keeps the liner in place preventing overhangs and untidiness. Odour Filter: Provision of an odour filter means you don’t have to empty your bin before it’s full. This carbon filter placed on the underside is very easy to replace. The Joseph Joseph Totem bin allows you fill your bin easily. Durable and well-finished materials ensure easy maintenance and a long waste disposal service. An odour filter prevents frequent emptying of the bin and waste separation makes the recycling process much easier. The hinge is not that durable and the main coating wears off quickly. It’s also a bit expensive for a bin! Construction: The Simplehuman is made of stainless steel and is capable of lasting in tough environments. The pedal is made of stainless steel which means it lasts longer. The whole unit is sleek and the liners are very clean. Spacious Compartments: This rectangular recycle bin features a space saving design and two inner buckets. These ensure that waste is stored separately for an easy recycling process. 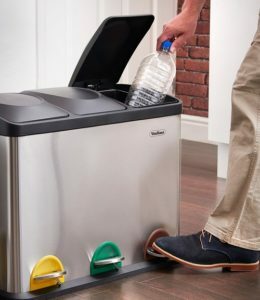 This 46 litre recycling bin is large enough to eliminate frequent emptying and multiple rubbish bags in your home. This bin is simple to use and lasts longer. It makes the recycling process easier and more effective. It also comes with a 10 year warranty and the capacity is very large. It does not leave fingerprints and is very easy to clean. Reports of faulty buttons especially the one used to hold the bin open. The handle is placed at the back which is a bit inconvenient. Capacity: This is a 45 litre stainless steel recycling bin, a capacity which makes cleaning more tidy and easier. It comes with three separate buckets each with a capacity of 15 litres allowing you to throw in your waste separately. This increases efficiency and promotes hygiene. 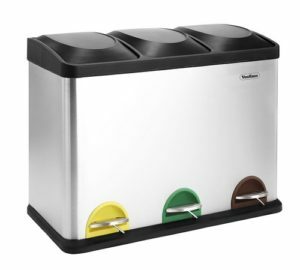 Compact Design: The VonHaus recycling bin is made of stainless steel with a satin finish. This makes it both functional and attractive. The lids are made of high quality plastic material. The whole unit is easy to clean and the base is non-slip. 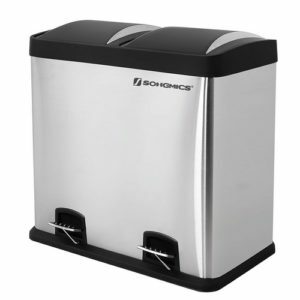 This bin is very neat and easy to use with smooth pedals and easy-to-open lids. A sturdy plastic interior eliminates the need for plastic bags. It has a very large capacity and well-divided apartments which aid the recycling process. Labels included are not that durable. The long shape makes it hard to find the right bags. Quality Material: The outer body is made of stainless steel with a sleek finishing. Its interior is made of quality plastic material resistant to chemicals and scratching. This bin is durable as well as aesthetically pleasing. Innovative Design: Plastic lids are simply operated using a pedal mechanism. The base of this bin is non-slip, eliminating scratches on certain kitchen floors. Large storage capacity: The Songmics bin has a 48 litre capacity which is provided in equally divided compartments. This makes the process of segregating waste much easier. This is complemented by metal handles which allow you to make easy disposals. Versatility: A handle attached at the back enhances mobility. The bottom is hollow so as to make the cleaning process much easier. It’s also easy to clean using water and regular detergent. A large capacity eliminates frequent emptying and the compartments improve segregation of waste for recycling purposes. A pedal mechanism improves the opening and closing process while eliminating odour. The Songmics is easy to use and clean. You probably need a weekly cleaning to maintain its original finish. There are reports that it also has a tendency to develop rust marks when scratched. 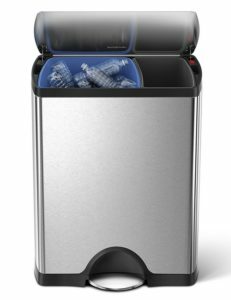 Packs: Whatmore is a 3 in 1 recycling bin, each with a capacity of 25 liters. This allows you to place different types of waste separately including food recycling, household waste and dry recycling. Construction and Design: It’s a light set of bins made of materials which are easy to use. The inserts are easy to remove and clean. Handles are placed on the inserts to secure bin liners and the bottom is easily removed when emptying your bin. Price: This unit is much cheaper compared to most stainless steel counterparts. An affordable price provides you with a neat and spacious bin. A 3-pack bin promotes tidiness and promotes recycling. Use and maintenance are very simple. There is a lot of difficulty in handling the lids. There are also reports that its hinges can stop functioning after a few months. Capacity: Look for a recycling bin with the correct size. One that is too large might waste space whereas smaller one may force you to empty your bin more frequently. The latter also cause waste to spill over which is very untidy. Regarding capacity, bins come with multiple compartments or in multiple units. Wheeled bins with a considerable capacity help in mobility. Construction Material: Quality bins are made of sturdy material like stainless steel and these should provide you with many long service years. Choose steel which keeps away rust in case of scratches and prints when handled. Other bins are made from quality plastics which are resistant to corrosion. Plastic bins are also cheap but are affected by temperature variations. Choose a bin which is easy to clean. Design: Bins with well-placed handles help to improve mobility and promote handling safety. There are few bins with hooks which help in securing liners to the interior. Choose a bin designed to save space in terms of height. Bins with non-slip base linings provide protection to your bin. Lids should also be easy to open and close. Provision of an odour filter especially one made of carbon keeps your house fresh at all times. Versatility: Success in recycling depends on how easy you can handle your bin. Compartments with the right size improve compatibility with plastic bags. Consider buying bins with visual cues like a red button for emptying. A well labelled bin makes the process of emptying and sorting waste much easier. There are new models which open automatically when they detect motion. Price: The price of a bin should match its design quality and performance. Prices vary due to material quality, size and branding.